Design and maintain the Stevenson University Faculty Help website. One stop shop for faculty to gain knowledge of Blackboard (through tutorials), EdTech Training's, Tech Tip Tuesday and other technology tools used at Stevenson University. Lead and Instructional Designer for Stevenson University's first MOOC endeavor. Winner of the 'Innovator of the Year' Award as given by The Daily Record. Create and maintain course social media sites. Using our course guide we created the semester before we learned about course management systems, visual design, content tools, communication tools, assessment tools, formative evaluations. We were then able to take our course guide and create a six module course in Moodle. 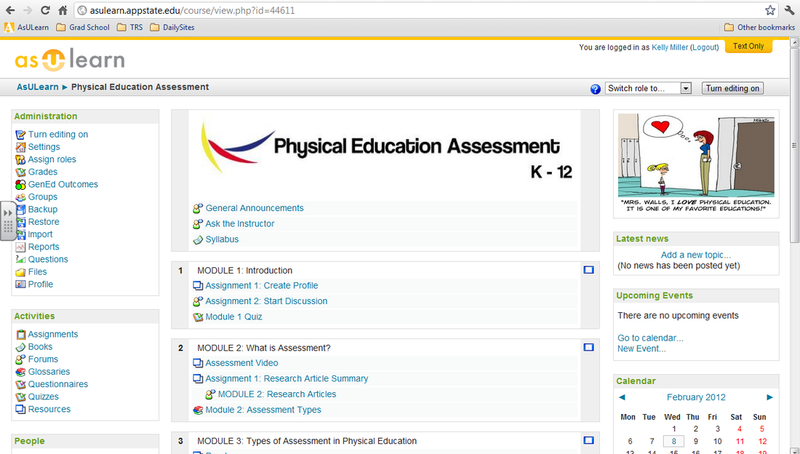 The course is set up behind a login/password system through the university but below is a screen shot of my course: Physical Education Assessment K-12. This class taught us how to create a course outline, assessment design, learner analysis reports, syllabus, course guides and peer reviews. As a freelance project I have redesigned a salon website, upgraded and added her social media accounts and started a YouTube 'how-to' channel for her site, shooting and editing the videos myself. I have also created a mobile site for her clients for their convenience. 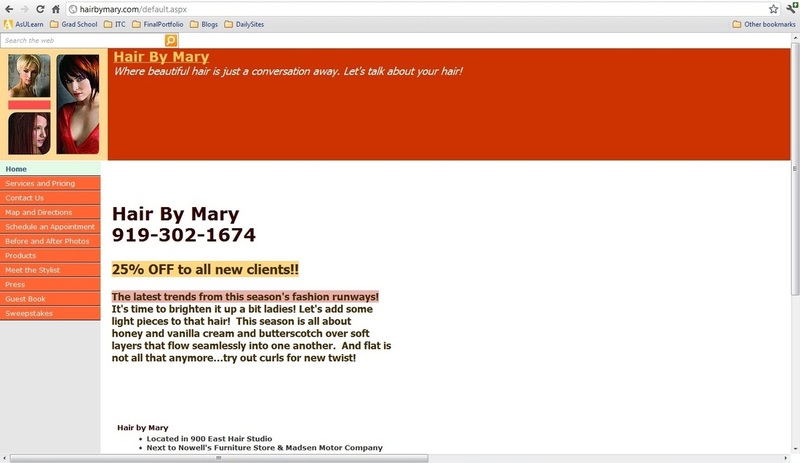 Below is a screen shot of her website before the redesign. ​Here is her CURRENT site. For my graduate final portfolio my project partner and I created a Mentathlon, which is a cerebral Olympics that coincided with the 2012 Olympics in London.. This was an online cooperative challenge that included students from local academic institutions as well as those recruited through social media efforts. It was a free, week long, event that could be done multiple times over the summer by different groups. Each day there was an academic challenge that focused on a subject area and always incorporated technology as well as an Olympic theme. Students worked together to submit their project for that day. Projects were judged and medals awarded. Below are a few pieces of the project.